One question we always get is about our favorite places to travel. While it’s a hard thing to answer (and it changes frequently), Italy is always part of our litany of responses. The hilltop views, the ancient sites imbued with tales of gods and emperors, the amazing wine for just a few euros, the hidden hot springs, and the Mediterranean sun–there’s everything to love about Italy. And it’s all true of Sicily, too. Because there are so many great cities to choose from, it’s not whether to go but rather where to go in Sicily that’s the question. Sicily is a huge island, which we didn’t fully appreciate until we began planning our itinerary. Sicily is just a little smaller than the state of Massachusetts and the entire country of Albania. That’s a lot of ground to cover. And because many of the ancient sites were built near the coast, many of the top things to see in Sicily are on the periphery of this triangle-shaped island. 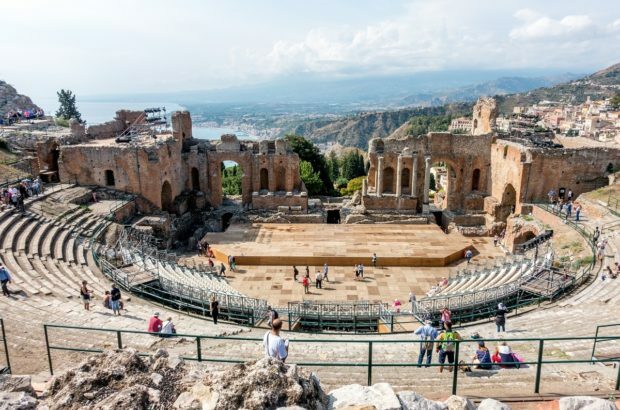 With only one week in Sicily and a desire to see as much as we could, we chose to cover much of the northern half of the island, hitting both the east and west coasts. We spent a maximum of two nights in each city as we drove our way around Sicily. Part of our itinerary was influenced by needing to catch the ferry for our trip to Malta, so while we didn’t get to every beautiful place in Sicily, we did see many of them. From its perch high on a hill in eastern Sicily, Taormina easily offers some of the best views on the island. Its centerpiece is its ancient Teatro Greco which dates from the 3rd century BC. From the top of the amphitheater, you can look out over the Mediterranean and the Sicilian coast speckled with terra cotta roofs. On a clear day (unfortunately, we had clouds), you can see Mount Etna rising in the background. Taormina has been the most popular tourist destination and one of the best places to visit in Sicily for several centuries. Along with the theater, its medieval buildings, shops, and restaurants make it a popular cruise excursion and day trip. That means it gets crowded during the heart of the day, so it’s best to go early or late to avoid the crowds, which can be overwhelming as they snake through the ancient streets. For a (sometimes) less congested environment, add the beach at the base of Taormina to your Sicily itinerary. We based ourselves just five miles from Taormina in the town of Giardini Naxos. It was much easier to have the car there, and hotel rates in Taormina were considerably more expensive. We stayed at the Atahotel Naxos Beach Resort Hotel, a sprawling complex with lovely gardens, pools, and beach access (Read TripAdvisor reviews | Book a room). The nearby Hilton Giardini Naxos is also a good option (Read TripAdvisor reviews | Book a room). 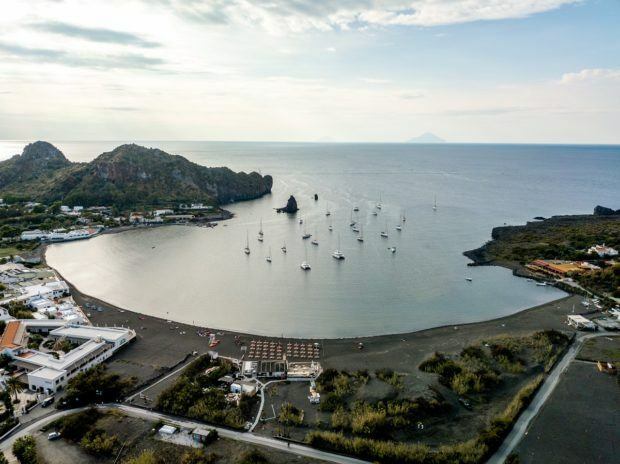 Vulcano, one of the Aeolian Islands, is a must-visit on your trip to Sicily. This curious place is exactly what it sounds like—a volcanic island. In fact, the word “volcano” in English and its equivalent in several other languages come from the name of this small island 16 miles north of Sicily. We were drawn to visit Vulcano by its mud baths and black sand beaches. The hot springs and mud baths are a result of the volcanic activity, which warms the water and creates a glorious mud pit only about 5 minutes’ walk from the ferry port. Although the air can be a little sulfur-scented, we loved coating ourselves in the therapeutic mud and luxuriating for a bit. Less than a mile from the mud baths is the striking black sand beach, Spiaggia Sabbia Nera. At this scenic spot, the beach curves around a glassy sea. You can rent and umbrella and chair or grab a snack at one of the beach restaurants. The setting is practically perfect in every way. If you’re feeling more adventurous, trekking up the volcano is one of the top things to do on Vulcano. Plus, there’s shopping, wine tasting, and plenty of relaxing to be done as well. We’ve written in more detail about our day on Vulcano—including how to get there—here. The ferry to Vulcano leaves from Milazzo, so that was our base for the evening. We loved the stylish and modern Locanda del Bagatto and its wonderful adjoining restaurant (Read TripAdvisor reviews | Book a room). Cefalu is one of the most beautiful towns in Sicily. It’s perfect for leisurely strolling and exploring the pedestrian areas and squares. In the summer, this town of 14,000 swells as tourists swarm its beaches, but in the shoulder season (when we visited), it couldn’t be more lovely and calm. Like Taormina, Cefalu’s setting is dramatic thanks to a massive rock. But, in this instance, the town sits at the base. Cefalu has a friendly seaside that’s one of the best places in Sicily for lounging and honey-hued buildings full of shops and restaurants great for sampling. 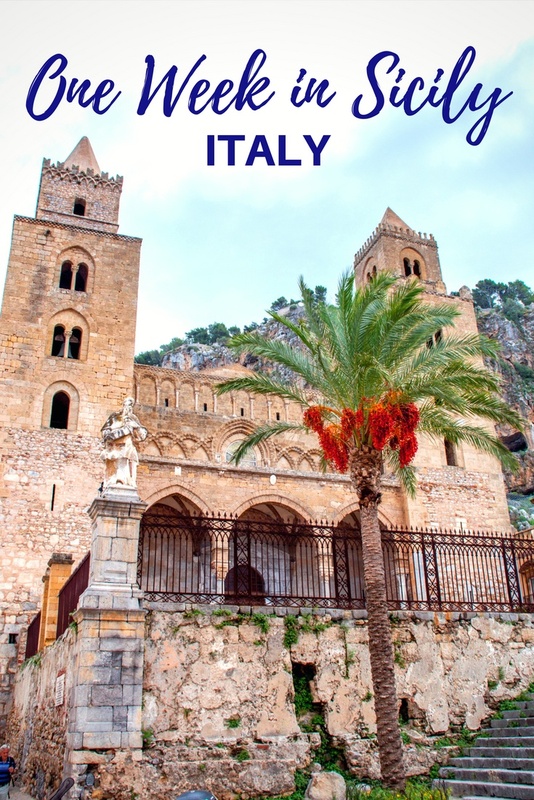 One of the biggest Sicily tourist attractions is the Duomo di Cefalu. Along with eight other sites, the Duomo is designated as a UNESCO World Heritage site because of its architecture and amazing mosaics. Begun in 1131 by the Normans who ruled Sicily at the time, the cathedral looks like a fortress on the outside but houses amazing works of religious art on the inside. Even if you’re not much for visiting churches, these mosaics are worth seeing. Let’s face it—there are a lot of stereotypes about Palermo, and many of them aren’t flattering. We expected grittiness, weren’t sure how safe we would feel in certain places at night. Our expectations weren’t high. Palermo challenged every one of our assumptions and left us loving the city. At the crossroads of the Mediterranean, Palermo has been influenced by cultures throughout Europe and North Africa for centuries from the Romans to the Arabs to the Spaniards and beyond. That multi-culturalism is evident from the architecture to the food to the inhabitants of Palermo. Several of the big tourist sites in Palermo are churches, namely Palermo Cathedral and the glittering Palatine Chapel. The Palatine Chapel is the royal chapel of the Norman kings of Sicily and a Sicily must see. Commissioned in 1132, it feels like every inch of the great room is covered in gleaming gold mosaic. Every detail is a sight to behold, and when you account for the fact that it’s nearly 900 years old, the effect is amazing. It’s not all about history, though. Palermo (as you would hope in Italy) has an amazing food culture, too. The three city markets are filled many hours of the day with people shopping and indulging in the numerous kinds of Palermitan street food. There are also street-side grills and, of course, many delicious restaurants to choose from. Palermo is notoriously challenging to drive in, so we stayed as close to the main coastal road as possible. This made it easy to drive and easy to park, and we were still only a 10-minute walk from the historic city center. We stayed at the charming Abatellis Luxury B&B, which was comfortable and quiet and served some of the best cakes ever (Read TripAdvisor reviews | Book a room). Other solid options include the charming Palazzo Pantaleo (Read TripAdvisor review | Book a room) and the highly-rated Massimo Plaza Hotel, which is located just across from the famous Teatro Massimo (Read TripAdvisor reviews | Book a room). Just 9 miles (or a half-hour drive—traffic is crummy) from Palermo is Monreale, one of the top Sicily destinations. The cute hilltop town is famous for its Cathedral of Monreale. As with the other cathedrals and churches mentioned in Palermo and Cefalu, this one is part of the collective UNESCO World Heritage Site of Arab-Norman churches. Otherwise, I promise I would not be mentioning another church again. We really aren’t huge into churches, but the Cathedral of Monreale may be the most spectacular one we’ve ever seen. It has 130 mosaic scenes, 200 carved columns, and a massive 65-foot-tall mosaic of Christ Pantocrator over the altar. The mosaic is estimated to be covered in over 2 tons of gold. It’s spectacular. With a look at the Cathedral and a quick coffee or meal on the square, you can be back on the road headed for Segesta. The ruins at Segesta are one of the most evocative ancient sites and places to see in Sicily. Segesta was once a major city of the Elymians, an ancient civilization who lived in western Sicily for centuries during the Bronze Age and classical antiquity. The population was annihilated by the Greeks in 307 BC, but its architecture remained. Although little of the ancient city survives in the spectacular canyon setting, what’s left is remarkably well-preserved. The Doric Temple at Segesta dates from around 430 BC. Although never completed, its 28 massive columns still stand. On a nearby hilltop (you can take a shuttle or hike up), the 3rd-century amphitheater has spectacular views. The approach to Erice is a nail-biting series of switchbacks that send you a half-mile above sea level (it made Lance nervous, which doesn’t happen often). A medieval town on the top of Mount Eryx, Erice is renowned for its views of the sea and the valley below. As with many towns in Sicily, Erice was ruled by numerous civilizations over the centuries, including the Elymians, the Phoenicians, the Carthaginians, and the Romans. It was even the center for the cult of Venus. Each culture contributed to Erice’s architecture and layout, leaving bits and pieces in the grey stone town, some of which can still be seen. Erice is known most for three things: incredible pastries at Maria Grammatico’s pastry shop, the views from the city, and its wild weather that can go from sunny to foggy in just a few minutes. Unfortunately, we got a taste of the weather, which means we missed the views. We focused on the pastries instead, sampling Sicily’s best cannoli. After our snack break, we continued on our way. We were a little underwhelmed with our experience in Erice thanks so the weather, but it probably would have been different with sunny skies. We visited the towns of Trapani and Marsala for three reasons. The first and most practical reason was that they were on the route as we made our way south toward Agrigento. The reasons we chose these specific towns were because we wanted to see the salt flats of Trapani and to try the wine in Marsala. At the Trapani salt flats, the ocean water comes right up to the land, just held back by the narrowest of dikes. We were so close that it seemed like a tide or a moderate wave would push the sea over the ledge and right onto the road. Having the water very close (as in Gozo), helps the salt production, as it is pumped up and over into its pans to await evaporation. Trapani is home to the Museo delle Saline (aka Salt Museum). Its exhibits go into great detail about the process of making salt, and you can see the mill at work on certain occasions. Climbing to the top of the mill provides gorgeous views of the salt flats and the sea, but unless you have an particular interest, the museum is skippable. Instead, stop for a meal or a drink at the restaurant and enjoy the view. With more time, consider a cruise to the nearby gorgeous Egadi islands for swimming, eating, and exploring. Just a half-hour away in Marsala, we found the thing we set out for—the town’s namesake golden wine. Some wineries in Marsala offer tours and tastings, but you must book in advance. We were lucky to join a tour at Cantine Pelligrino, one of Marsala’s best and oldest wineries, now in its sixth generation of family ownership. We learned about grapes that were unfamiliar to us like the white, fruity Inzolia or the sweeter Grillo along with Moscato, one of Lance’s favorites. Inside, we wound our way through exhibits about winemaking and the Pellegrino family history. And then we got to sample three of Pellegrino’s best straight from the giant wooden barrels. The sleek, comfortable SLO Design House is an ideal spot for exploring Marsala and the surrounding area. Views from the private rooftop lounge area can’t be beat (Read TripAdvisor reviews | Book a room). Friendly hosts and a home-cooked breakfast make I Tramonti Sul Mare a great choice (Read TripAdvisor reviews | Book a room). The Valley of the Temples in Agrigento is the island’s top tourist site and one of the best places to go in Sicily. Surrounded by olive groves and almond orchards, the UNESCO-listed site is full of Greek ruins above and below ground. The Valley of the Temples is known for having the best-preserved Doric temple outside of Greece, and it has a little less scaffolding and fewer cranes than the Parthenon does right now, too. The archaeological park consists of six temples built between 510 BC and 430 BC. The star is the Temple of Concordia in the middle of the park. Thanks to its location on soft clay and its use as a church and for other purposes, it has survived earthquakes and other types of damage over the centuries. There’s also the Temple of Juno, the Temple of Heracles, and the remaining three columns of the Temple of Castor and Pollux, among other ruins. The buildings that still stand here make it clear how wealthy the ancient town of Akragas—one of the most impressive cities of Magna Graecia—once was due to its favorable trade agreements and position right on the ocean. The Valley of the Temples offers different walking tour throughout the day, and you can buy tickets for them when you arrive. We joined in on a tour exploring the catacombs and death traditions of the people who once called this city home. The descriptions at the attractions are sufficient, but having a tour guide is sometimes nice to understand the site more completely. Bamboo Luxury B&B in Agrigento was one of the nicest places we stayed in Sicily. With a spacious room, comfortable seating area, and a terrace for eating breakfast outside, it was practically perfect (Read TripAdvisor reviews | Book a room). Our time in Catania was brief. Sicily’s second largest city was hit by duel disasters—the eruption of Mount Etna and an earthquake—in the late 1600s, which destroyed most of the city. As a result, it doesn’t have the ancient sites you’ll see other places in Sicily. However, it does have plenty of Baroque buildings and sprawling piazzas as a result of the rebuilding, which have landed it a spot in the UNESCO World Heritage list. If you’re flying elsewhere in Europe, you’re likely to go through Catania. Take the time for a walking tour through the city. If you love markets like we do, don’t miss the festival of seafood that is the fish market that happens every Monday through Saturday 7:00am-2:00pm. Visit the nearby Piazza del Duomo and see the unusual elephant fountain and the Duomo itself. Stop in to one of the hip bars or have aperitivo in a square and watch the city buzz around you. Transportation in Sicily is much more limited than the rest of Italy. The Sicily train system is almost non-existent (connecting only handful of cities along the northern coast). The buses in Sicily provide more options, but make lots of stops and are really slow. If you really want to get around and you want to explore Sicily, you need to rent a car and drive. Book ahead. The availability of rental cars in Sicily (particularly during peak season) can be limited. Many of the rental agencies at the Catania or Palermo airport have fewer cars than at similar agencies in other cities. Book ahead! 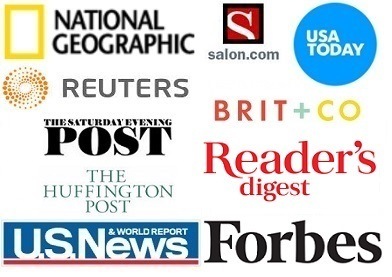 We encourage you to book from a major agency and suggest using this comparison site to find the best deals. The chances of an accident on the island are much higher than other places in Europe, so we recommend taking full insurance. Get licensed. The International Driving Permit (IDP) is required in Italy. Your rental agency may or may not need to see it to rent the car. But if you run into trouble on the road, you can guarantee the police will want it. There’s a hefty fine for not having one. Car selection. Roads in Sicily are generally better than we’d been led to believe, but they aren’t great. They can be extremely narrow at times and most parking is on-street, parallel parking. Get the smallest size of car you can that still has an enclosed trunk or a trunk cover. There is a problem with breaking into cars in Sicily and you’ll want to hide your luggage. Even if you can drive a manual car, consider upgrading to an automatic. Sicily is so hilly that it will help you navigate difficult hilly situations without the roll-back of an automatic. Rules of the road. Italy like most of Europe drives on the right. Follow what other cars do and you should be fine. Don’t pass on the right. Don’t sit in the left lane on the highway (called an autostrada). If someone flashes their lights at you, move over. If someone honks, pay attention and go. 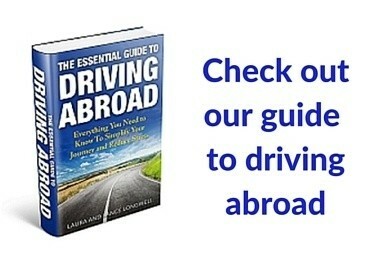 If you are not accustomed to driving in a foreign country, our ebook, The Essential Guide to Driving Abroad, may be be helpful. Parking in Sicily. Nearly all parking is on street parking – if you can find it. If asked by an attendant (even if he doesn’t look official) to pay, you should pay. Parking kiosks are almost non-existent and forget about the concept of “spaces.” If there’s a spot, it’s a parking spot…as long as it is not labeled otherwise. Parking garages can be found in some of the bigger cities like Catania and Palermo (as well as Taormina). Driving in Sicilian towns. In smaller towns, parking will be at a premium. Do your best and find a spot where you won’t disturb someone. Consider parking a little outside of the main city center and walking in. Do not use your car horn in small cities (it’s usually illegal). Pay special attention to the one-way streets. Driving in larger cities. Driving in major cities like Catania or Palermo is not for the faint of heart. It can be a real adrenaline rush. Be very careful of scooters and motercycles weaving in and out of traffic. Even if they perform an illegal maneauver, cut you off, or brake suddenly, you’ll get the ticket if there’s an accident. Try to park out from the main city center and walk in. There is almost always some kind of parking garage or lot near the train or bus station, so head in that direction if nothing else works. Take your time. It takes a lot longer to get anywhere in Sicily than you would expect based on distances. Allow lots of extra trime to get there. Enjoy yourself. This is supposed to be fun! Try to laugh at your wrong turns and smile at the locals. You’ll have an amazing story to tell when you get home. Note: Some links may be affiliate links, which means Travel Addicts may earn a few pennies if you buy something.